Baltimore’s Andy Bopp is one of the city’s true treasures; a pop-song magician on par with Matthew Sweet and Jon Brion, the artistic progeny of Alex Chilton and Paul Westerburg , a high priest of Ray Davies and Paul McCartney. He’s perhaps best known as the one man band Myracle Brah, a project that has so far generated 7 exquisite albums between 1998 and 2007. Andy’s first band, the energetic Love Nut, caught the ear of Interscope records and released Bastards of Melody, which, along with the likes of Sloan and Fountains of Wayne, made post-punk power pop the next big thing (or so we hoped). The majors thought otherwise, no doubt, and Love Nut’s second album, Baltimucho! was almost lost in some basement in Santa Monica until it was finally released by the much smaller Big Deal Records in 1999. More recently, in 2011, Andy and his new-yet-now-also-defunct band Alto Verde released Paper Clips, or what Weezer would sound like if Rivers Cuomo was obsessed with Alex Chilton instead of Brian Wilson. It’s a shame Alto Verde will not be releasing any new songs in the near future. The same can be said for Myracle Brah. What are Andy Bopp’s fans supposed to do? Thankfully, a new project has emerged, taking Andy Bopp’s writing chops in heretofore unforeseen directions. 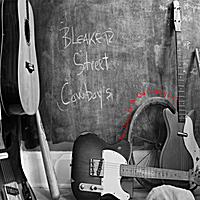 On the surface, the country-rock of the Bleaker Street Cowboys does not much resemble Andy’s familiar modern power pop. The songs are full of bare bleach- boned vintage guitars, snappy drums, and harmonies rich with machismo and twang. The album rides the range from the barn-stompin’ “Bumpy Ridin” to the smooth rockabilly sounds of “On My Way” (hints of Orbison, or perhaps Chris Isaak, with guitars swelling in reverb around a soulful croon), taking the listener across a fruited plains worth of Americana along the way. Andy has seemingly switched influences from the Beatles’ progeny to the Beatles’ progenitors. Why? “’Cause I’m 51,” says Andy, “and I wanted to go with something that I felt was timeless where when I’m 75 I can still be playing country.” The eponymous album is subtitled New Songs for the Old Country Soul, but it isn’t a mellow album. The sound is electric, and though those sounds may be of an old style, that style was famously created and made popular by hillbilly teenagers. “I always loved rockabilly guitar,” says Andy. “In the 80’s, when I was in a cover band, and we would be playing, like, Stray Cats and stuff, I was totally into that.” Since those early cover band days, Andy’s had a number of country and rockabilly experiences with other projects, and decided he could do better. With his talented friends Chad Hopkins (vox, guitar), Joey Salvia (bass, frontman for the Montgomery Clifts from Dallas –“it’s commercially better to say we’re from Dallas”), and Nick Bertling (drums), he set out to make an album that was “pure energentic authenticity…Like jumping into a sonic time machine, when the likes of Sun Records ruled the airwaves.” In my opinion, he succeeded (you can decide for yourself; the album is currently available online). So, are we saying goodbye to Andy Bopp’s blissful power pop? Well, Andy is working on another new project, The Modern Ruins, in which he plays a baritone Telecaster, and the drummer plays a cocktail kit. “We have an EP coming out,” explains Andy. “It’s in-between the Bleaker Street Cowboys and Myracle Brah and Alto Verde. So it’s heavy, and there’s one song that’s country and there’s other songs that are almost like Creedence. So I kinda bridged all three with that.” I can’t wait.